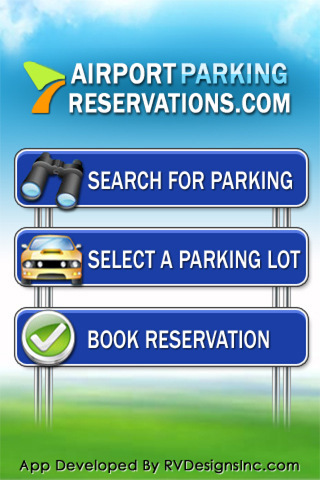 Developer Quote: "A very quick and easy way to reserve low cost airport parking at over 85 US and Canadian airports via more than 200 parking lots." Seeing as how Easter is in the next couple weeks, and summer not far behind, I can not help but think about the massive rush of traffic to the airport that is bound to happen over the next few weeks. There is also the fact that one has to park a car, and then perhaps catch a shuttle from that parking lot to the airport. Travel is not that easy when you have so many details to factor in your plans! • Detailed lot descriptions and directions. When you open the app, you must select your country of travel (USA or Canada), then select a city of Departure from the dial. Insert a time of arrival to that parking lot and then your return time to the same. Finally, tap Check Rates. You will see a list of parking lot possibilities appear (detailing price and distance to the airport), along with the option to Reserve. Check the My Reservation button on the bottom of the screen to view your plans at any time. Use the Settings button to either Sign In or Sign Up with airportreservations.com. I believe this app will be very helpful to travelers, although a wider range of airports and parking lots are needed. Still, you can't beat the convenience and simplicity of locating a spot while on the go using this clear, well-detailed app. COOL CONCLUSION: "Use Airport Parking Reservations-Find Lowest Rates when you need to find an airport parking spot in a hurry, at the best possible price."